No matter if you are a total Bohemian at heart or live the glamorous life of “The Bold & The Beautiful”, you can stretch your boundaries with burlap! Originally known for its utilitarian purpose, Burlap has evolved into a versatile textile for home décor. It looks amazing in an eclectic environment and adds a touch of soft reality to space that otherwise maybe too bewitching. The fabric now comes in a large variety of weaves and blends, textures, colors and even prints! Window Treatments: A loose weave of burlap will work best as it will let light filter into your space, yet you will still have the necessary privacy you need. 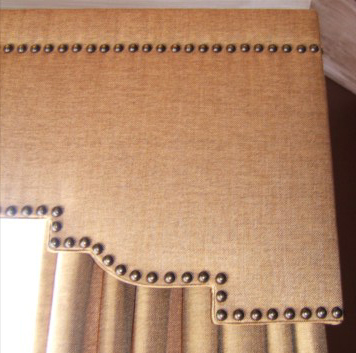 Upholstering Furniture: When upholstering your furniture with burlap look for a blended yet tight weave. This will give you a sturdy fabric that will be long lasting and most importantly comfortable to the touch. 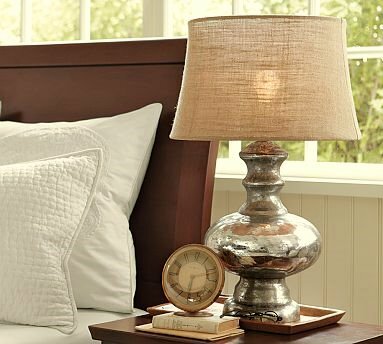 Look for linen-like burlap that will provide comfort, yet will give your room a more polished look. 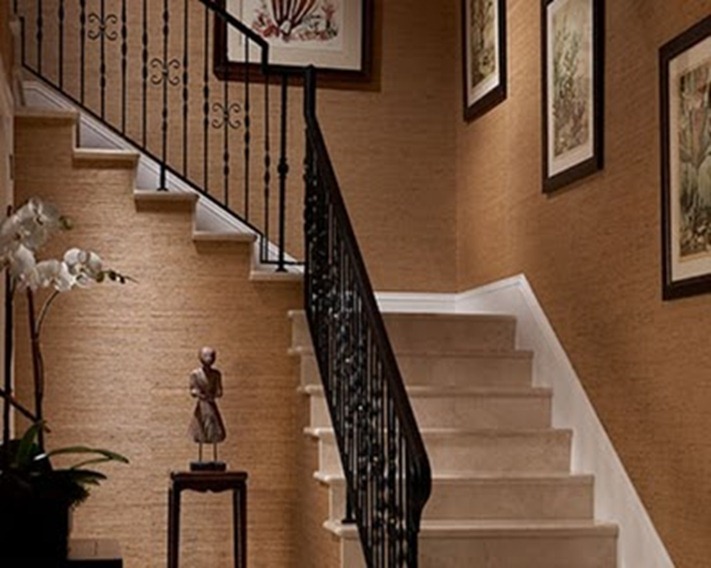 Wall Covering: Just like wallpaper, burlap can be used on your walls to create a cozy and warm environment. The fabric is laminated to paper before being applied to the wall. Accents: From ottomans, pillows, place mats, to lamp shades, cork boards and bed skirts … the sky is the limit when it comes to how you can use burlap. 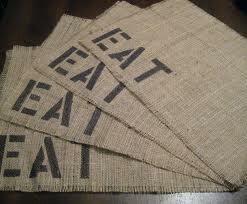 If you just want to incorporate a hint of burlap in to your space, small accents are the way-to-go! 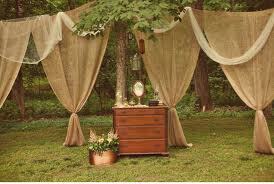 I would love to hear how you use burlap in your space! Post a comment below or send me a photo! 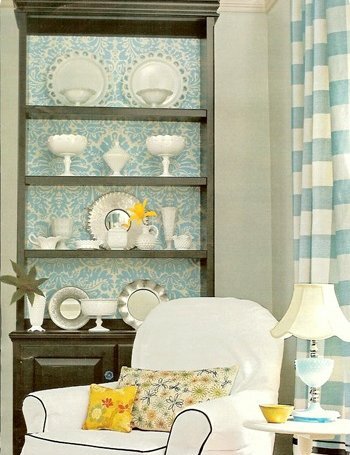 Add Whimsical Wallpaper to your Bookcase! If you are looking to add an extra layer of depth and texture to your Wonderland space or you simply want an inexpensive way to make a bookshelf come to life, consider adding whimsical wallpaper to the back of your bookshelf! This is an easy Do –It- Yourself project (or your carpenter will easily be able to conquer this task) and you will add instant interest to your space! First, you will need to measure the back of each shelf. If you are able to remove the individual shelves then you will be able to take one large measurement. Next, you will cut your wallpaper to match your measurements. Now, it is time to install your wallpaper using wallpaper primer and paste. Make sure you use the wallpaper smoother to smooth all bubbles and wrinkles out as you work. The damp cloth can be used to wipe away any excess glue. Last, allow your new and improved bookcase to dry overnight! 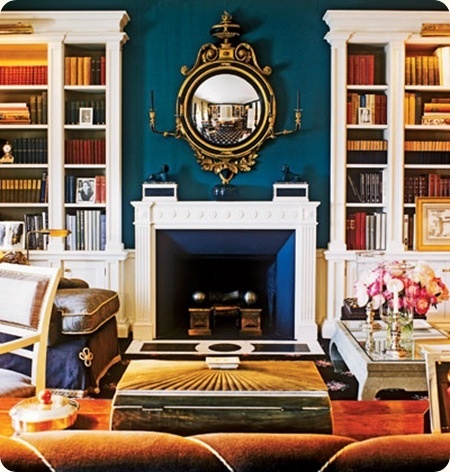 I would love to hear how you have incorporated wallpaper into your bookcase! Leave me a comment below or send me a photo! Keep Dreaming, Designing and Dwelling! Stripes make a Statement for Summer! Accessorizing your backyard for the summer can be done endless ways but why not pick a stripe to make your backyard sizzle! No matter if you are daring and want to use a bright color or if you want to keep it muted I have found three fabulous options for your wonderland out back and they are all at various price points! 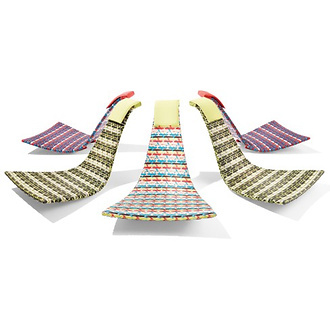 First is the Dedon Fedro Chair designed by Lorenza Bozzoli. The armless and legless chair is beautifully crafted and easily stacks for portability. It also comes in three color themes to mix-and-match or you can pick one to add a single splash of boldness to your backyard! 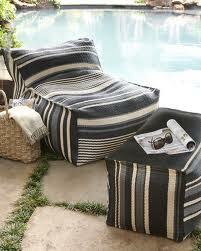 My next selection is Horchow’s Striped Beanbag Chair and Ottoman. This charcoal and natural stripe furniture set is the perfect selection for someone who wants to be surrounded by comfort and kick up their feet to relax! Also, if you want to add a punch of color with beach towels, throw pillows and table wear these neutral colors give you the freedom to do just that. The third choice is Crate&Barrel’s Stripe Folding Chaise Lounge. 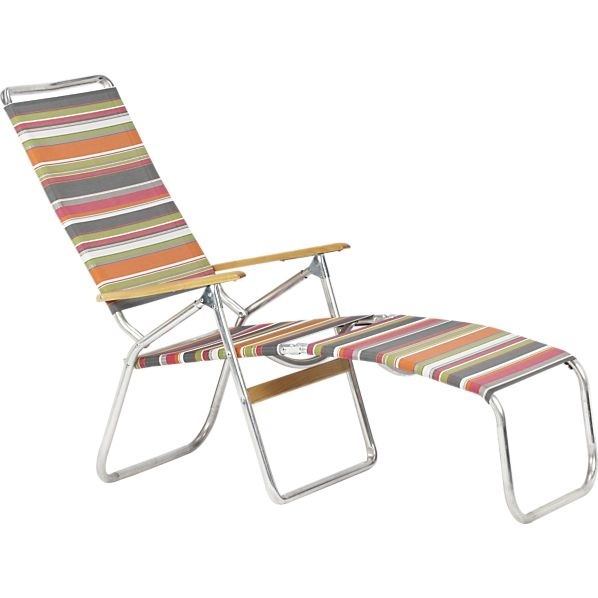 The playful colors of this lounge chair will add pop to any backyard and the variety of colors give you options to accessorize. Since the chair easily folds you can transport it from your backyard to the beach or park effortlessly. This is a great option for the person who is on-the-go! I would love to hear how you have incorporated stripes for the summer! Leave me a comment below or send me a photo! Keep Dreaming, Designing and Dwelling. 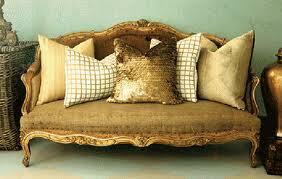 Dress Your Sofa with an Accent! When it comes to dressing your sofa keep in mind that your accent pillows are like jewelry, they can stay the same all year round or they can be switched out for the various seasons. Accent pillows will add depth, character and color to your space. They really are ideal when designing your wonderland! 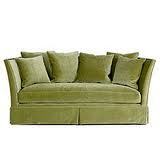 One thing I see people do is buy a new sofa and keep all the accent pillows that came with the sofa on it. I’ve actually heard someone in a store say, “I can’t buy that white sofa because the two accent pillows don’t match my current color palette.” I honestly had to hold myself back from saying, “You can toss them and believe me you should!” Please, don’t be afraid to toss the plain accent pillows aside and buy new ones! New accent pillows are an inexpensive way to add spice and glamor to your sofa and any space. 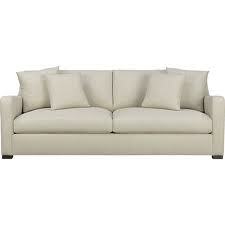 Below are my do’s and don’ts to sofa accent pillows. 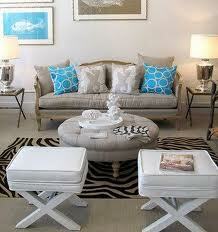 Let’s start with the DON’Ts: The two sofas below are shown with their original accent pillows. This look does not show depth or character. Moving on to the Do’s!!! All three sofas below have had their old accent pillows removed and have been replaced with accent pillows that add character, texture and depth! 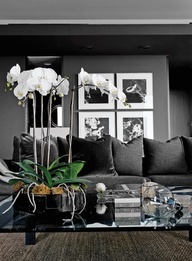 When it comes to sofas never be afraid to change them up with gorgeous accent pillows. Trust me they will add the interesting factor to your wonderland! Try mixing and matching various textures, patterns and colors until you have designed the exact look you want for your wonderland! I would love to hear how you use your accent pillows! Leave me a comment below or send me a photo! Pop – of – Paint! 1. What type of environment or “Wonderland” do you want to create? Are you painting a small nook for your own “me” time or are you painting your dinning room or maybe a cheerful place for your kids to play? 2. 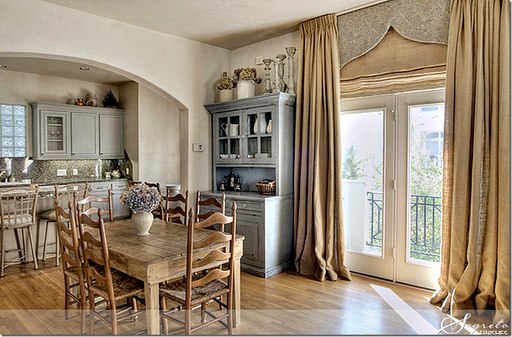 If you already have invested in furniture and fabric, does the paint you want to use compliment them? Paint is much easier to change than buying new fabric and furniture. 3. Are you planning on painting an entire room or just an accent wall? 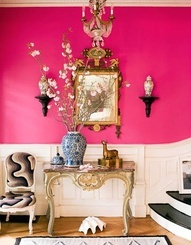 Consider this: a Hot Pink accent wall is easier on the eye and mood than an entire room painted Hot Pink! Sometimes painting just one wall is more of a statement than painting an entire room. 4. How will the paint you choose look as the light changes throughout the day? I would highly recommend either painting large, think one foot by one foot, swatches of color on your walls or poster board and determine if you like the color in the morning verse the afternoon verses the evening light. Remember the tiny swatch on a paint color stick looks very different on a LARGE wall and the color will change as the light hits it. All-in-all your choice of paint should reflect a piece of you. 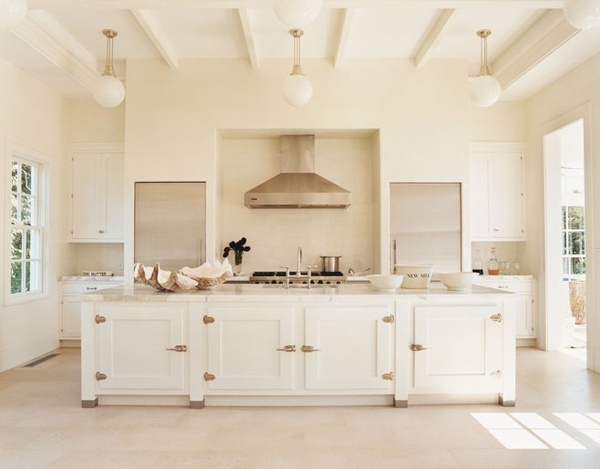 There is no wrong choice when it comes to paint; that is why paint stores are filled with thousands of endless options. Just make sure you take the time to dream of what environment you ultimately want to design because that time is much better spent than repainting a wall over-and-over! Take time to Dream, Design and Dwell. 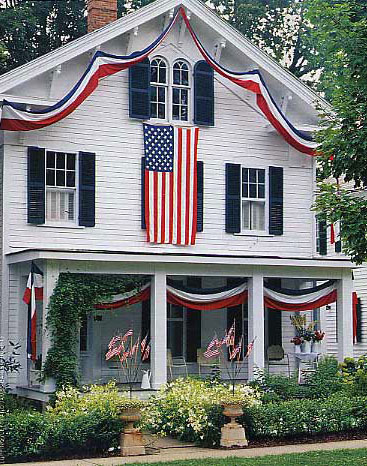 Wishing all of you Dreamers, Designers & Dwellers a very Happy & Safe July 4th!!! Let Freedom Ring in YOUR Wonderland. 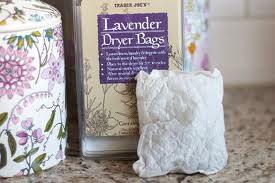 If you have not discovered Trader Joe’s Lavender Dryer Bags then you are in for a treat! This product not only leaves your clothes, sheets and towels smelling extra yummy and fresh but the bags are reusable to up to five times! The bags, which are filled with lavender seeds, can also be used for a variety of purposes. I like to put mine in my closet or chest of drawers for a continuous fresh smell. I also like to place one of the bags inside my pillows to create a relaxing and calming scent. These Lavender Dryer Bags are just another way I like to make my home my wonderland!